The summer I graduated from college I went on a month-long driving trip across the American South. We mostly pitched tents at steamy, mosquito-infested campgrounds, but on a few occasions, we splurged and stayed at a hostel. 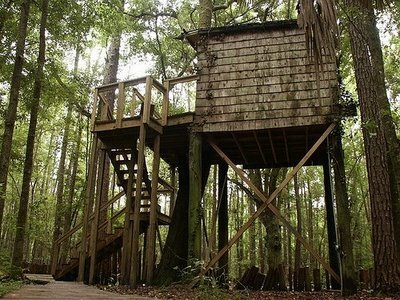 The most memorable of these was The Hostel in the Forest in Brunswick, Georgia. 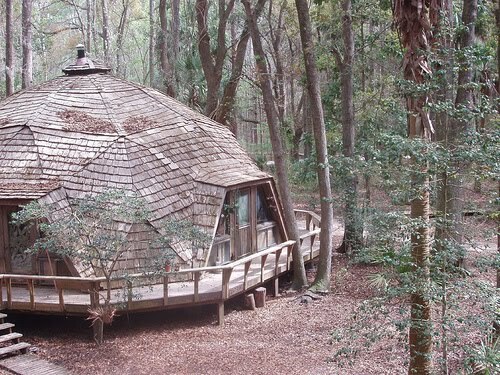 Situated deep in the Georgian forest, the hostel is made up of a geodesic dome, 9 tree houses and a whole crew of crazypants hippies. The gong outside the communal space signifies both meal times and collective bong toke times. It's all vegetarian, there's a sweat lodge, saw dust composting toilets, and most importantly, clothing is optional. Rachel: So do you get paid to work here? Dude: No. But I get all the pot I want and I get to see naked girls walking around. This made getting out of the pool slightly awkward. Isn't there some unspoken rule at nudist colonies that says you're not supposed to admit you're enjoying it? Anyway, the point of this post is not to contemplate the weirdness of hippies. 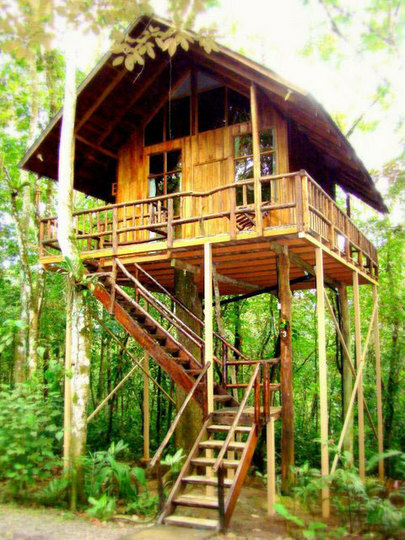 The point is to celebrate the awesomeness of tree houses. Despite nearly suffocating while covered in mud in a sweat lodge, I really did enjoy staying at The Hostel in the Forest. At least 95% of my enjoyment came from our private tree house room. Tree houses are incredible. They are the best possible way to fulfill childhood tree nymph fantasies and, more practically, to keep all the little forest critters at bay. I'm very glad to see that people other than Ken Kesey groupies are jumping on the tree house train. Did you see the super sweet spread of tree house hotels on Apartment Therapy? Financial Times also did a list of tree houses a few months ago. 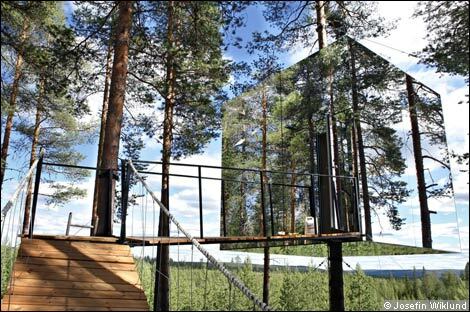 Look at this crazy future tree house in Sweden. I know I'm going out on a limb here (har har), but how amazing would it be to have a tree house hotel in the hills of Echo Park? Alright. Stoner fantasy over. But it coulda been so cool, man.